It is scary that the German government and politics are always happy to seek human rights, but in fact has long ago stepped into the bin. The demonization of Putin, Erdogan, Maduro are special examples of the political and media power of the rushing misinformation. While spiritual arsonists continue to focus on the media and try to emphasize the transatlantic friendship, the majority of German citizens have long since developed in a different direction. They now distrust the US more than China (! ), A country that also violates human rights. Dissidents sit in prisons, and criticism is fiercely opposed. Turkey has rightly accused China of operating concentration camps for the Uyghur Muslim minority and accusing it of it is eradicating religion and culture. The “Jewish state” in Palestine does not try anything else. As an occupying power, the “Jewish State” also runs the Gaza concentration camp and carries out genocide and reprisals against Palestinians. Week after week, Palestinians are brutally murdered by the Israeli authorities in an effort to flee this confinement. Egypt, which holds more than 60,000 political prisoners in inhumane prisons, is praised by Chancellor Merkel and German politicians and industrialists, as well as the Egyptian “leader” al-Sisi. Everything is done to keep these countries happy, so that German industry and its export flourish. What has become of German politics? If the Commissioner for Migration, Refugees and Integration, Widmann-Mauz, calls for “respect for the way we live” and strives for the “Judeo-Christian tradition that has marked the value of humanism”, then that is particularly disrespectful not to outbid the Muslims living here. What does she want to achieve with it? That migrants feel marginalized and are told how to recover from the “German nature”? What has this “Jewish-Christian” tradition brought us? An exaltation of this culture, which always turns into “Un-culture”, as we are currently experiencing. So when the cultures collide and are not taken as they are then a bang will come. Whenever we read one-sidedly about the “negative sides of Islam”, about so-called honor killings, women’s oppression and medieval structures, and the fear of “Islamist terrorism” is constantly raised, an Islam incitement is deliberately fostered. Why was the only Muslim kindergarten closed? With flimsy arguments that the bearer of the day-care center, the mosque association Arab Nile-Rhine, which bears the Mainz Al-Nur Kindergarten “represents the contents of the Muslim Brotherhood and Salafism and thus no longer stands on the ground of the Basic Law? Counter question: Are Jewish day-care centers still on the ground of the Basic Law, if they represent contents of the “Jewish state”, which clearly violates international law and human rights? Clear double standards and discrimination! While “alleged” anti-Semitism is becoming more and more exaggerated in the media, and anti-Semitism officials will soon be sitting in every town hall, but in fact the racist attacks against Muslims are on the rise, the post of racism officer is still vacant. However, this does not seem to interest politics any further, as it tries with all its might, together with the Israel lobby, to focus exclusively on the allegedly rising anti-Semitism, which in reality has not risen, but with targeted actions in the foreground is written. Every day, new articles and TV programs appear that outdo each other in pointing out the increase.What does that suggest? First of all the danger of “Muslim immigration” and secondly the “anti-Semitic” of any criticism of Israel. It’s amazing how the defamation of anti-Zionism to anti-Semitism has become a bullying symbiosis. New formulas for allegations are used to point out the danger.While right-wing extremist hordes are now mobbing villages and towns and there are AfD tendencies that clearly fish in anti-Semitic waters, while the AfD, as a party, quite explicitly affirms that it is on the side of the Jews and of Israel. I can only warn again and again to vote for this party, even if the understandable disenchantment with politics over the policies of other parties increases more and more, which I fully understand, I feel the same way. The Israeli lobby’s policy is only to defame Israel critics in public life with massive campaigns. They do not shy away from questionable means, and that actually connects them again with the right-wing extremist policy of the “Jewish state”. Meanwhile, the respected historian and anti-Semitism researcher Benz, who taught at the Technical University of Berlin until 2011, is denigrated because he refuses to confirm an increase in anti-Semitism and criticized the new reporting office for anti-Semitism. Benz is right when he criticized this “RIAS” position as something denunciatory, after all, anti-Semite is the gravest reproach in Germany. Really? Is this term meanwhile not unbelievably “devalued” by the inflationary use? If Jewish citizens are made anti-Semites simply because they have the decency to criticize the “Jewish state” for their disempowering occupation and apartheid policies, and Jews in Germany are banned from performing, then something goes wrong in Germany. If only those Jews are being courted who are in solidarity with Israeli politics, then we have reached a point that reminds us of a time in Germany that has already caused a mischief. If Jews are again turned outsiders by philosemitic politicians and representatives of the Israel lobby today, then this is a crime that can not be made good again. No, it is certainly not anti-Semitism to criticize the “Jewish state” and demand an end to the occupation or support the BDS movement. If Jewish citizens take over their responsibility for Palestine, while German politicians ignore it and prefer to ally with the “Jewish state”, then something is not right in Germany. So much for the recurring fake argument “do not buy from the Jew”. Only 74 years after the liberation and the end of the war, the enemy image of Russia is being rebuilt. What led to sanctions and protests in the case of the Crimea homecoming after a correctly expired referendum (!) Does not detract from the friendship with the Jewish occupiers. For decades, they have been allowed to commit unpunished, illegal annexations, and human rights abuses of the worst kind, making the living conditions of the Palestinians increasingly unbearable, building walls and checkpoints to achieve the final solution of a Judaized Palestine. Therefore, they are considered and rewarded with ever-expanding cooperation. What else needs to happen until German politics wakes up and thinks?However, we seem further away than ever before, more and more the importance of transatlantic friendship is sought, which is supposed to be so important for our protection. What protection and from whom? We should all ask ourselves this question if the German government, in accordance with Trump’s orders, but against the interests of its population, increases the military expenditure more and more, supported by German government policy. The German government is being blackmailed by US Ambassador Grenell, who, against every diplomatic practice, is making unspeakable demands for the end of Nordstream 2 or the Iran-EU agreement. It is basically just about the “America first” with the blackmail attempt, to sell overpriced US LPG to Germany and Europe. We need both agreements urgently, but no US bases, nuclear weapons and blackmail that harm the German economy. Finally, when Federal President Steinmeier finds “clear” words on Venezuela’s situation as part of his trip to South America – because the country is “after years of autocracy and mismanagement on the edge of the abyss”. Steinmeier called for free presidential elections, because only a new president “on a credible, legitimate basis” could give the people of Venezuela a future. What is this German interference and what gives him the legitimacy to express himself? Has Federal President Steinmeier ever advocated free and democratic elections in illegally occupied Palestine or criticized an Israeli prime minister? In fact, Chancellor Merkel never intervenes in the “internal affairs” of the “Jewish state,” even though these are not “inner” ones, but affect us as well, which, out of historical responsibility, we have a responsibility for Palestine and the Palestinian people, always is forgotten again, but until Palestine is free. Meanwhile, it has become “normal” that the Netanyahu regime interferes in internal affairs of German politics and culture. The fact that he tries not only as a prime minister, but also as a war, culture and foreign minister in one person to interfere and to take more and more influence and pressure, may not be tolerated. We have experienced this influence and this wealth of power in the last ten years. Will we soon see Israeliization in Germany, which will increase again? 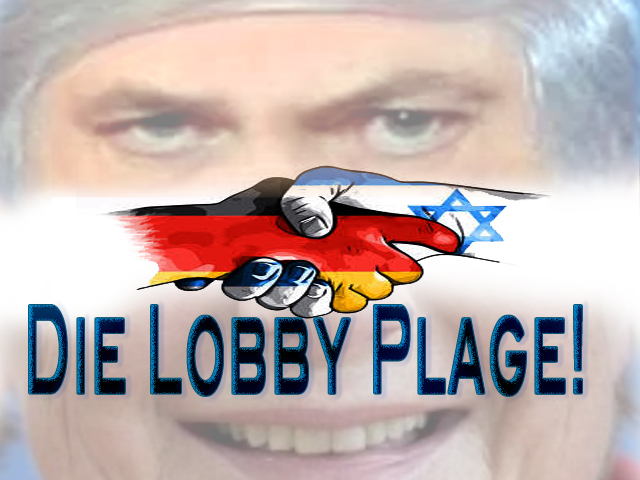 Netanyahu tries to do his Judaisierung in Germany. He, who tramples on the rights of the Palestinians, has also scored points with the AfD, which is quite openly living out its hatred of Islam and thus finds itself in good company with the far-right politics of the “Jewish state”. In addition, he openly tries to wedge the European partners if he provocatively does not come to Munich for the so-called security conference, but flies to Warsaw to attend the more than controversial Warsaw Anti-Iran Conference. Not that we regret his absence in Munich, he sends high-ranking representatives. After all, when it comes to war and weapons sold as “security”, the “Jewish state” is always there. But it shows how Netanyahu is trying to band together with Iran-hostile and Islam-hating states to push a wedge into European politics, much like his friend Trump did. but flies to Warsaw to attend the more than controversial Warsaw Anti-Iran Conference. Not that we regret his absence in Munich, he sends high-ranking representatives. After all, when it comes to war and weapons sold as “security”, the “Jewish state” is always there. But it shows how Netanyahu is trying to band together with Iran-hostile and Islam-hating states to push a wedge into European politics, much like his friend Trump did. but flies to Warsaw to attend the more than controversial Warsaw Anti-Iran Conference. Not that we regret his absence in Munich, he sends high-ranking representatives. After all, when it comes to war and weapons sold as “security”, the “Jewish state” is always there. But it shows how Netanyahu is trying to band together with Iran-hostile and Islam-hating states to push a wedge into European politics, much like his friend Trump did. So it brings us back to the topic, the respect that German politicians demand of Muslims, they should also prove the Muslims in Germany and not always see everything only through the “Jewish-Christian” glasses. This requires the respect for human rights, which are increasingly losing themselves in an unrestrained policy of indecent recklessness, following the example of the USA and Israel.